A watchdog agency in charge of overseeing the Internal Revenue Service issued a report today finding that the agency issues billions of dollars of payments every year to taxpayers who erroneously claim that they are due a refund under the Earned Income Tax Credit and other tax credits. However, at a time when bashing the IRS is a favorite pastime of many members of Congress, the Treasury Inspector General for Tax Administration laid most of the blame not on the beleaguered agency, but on those same lawmakers. The IRS has, for years, known and reported that nearly 25 percent of the EITC payments it makes are going to people who don’t actually qualify for the credit under the law. And in a vast number of cases, the agency has the ability to identify these false claims before payment is issued. However, it has neither have the legislative authority to stop those payments from being issued nor the necessary resources to investigated incorrect EITC claims on an individual basis. The numbers are staggering. By its own estimates, the IRS paid out $15.6 billion in improper EITC refunds last year -- 23.8 percent of the total payments made under the program. That puts the agency far over the rather permissive 10 percent target that Congress set for improper payments in legislation passed in 2012. An additional $7.5 billion was wrongly paid out through two other tax credits — the AOTC and the ACTC. However, TIGTA’s report finds that the nation’s tax collector doesn’t have a whole lot of choice in the matter, even after passage of a recent bill meant to increase its capacity to crack down on waste, fraud and abuse. That lack of authority might not be a problem if the IRS had the resources it needs to investigate tax returns that appear to contain bogus refund demands. But after years of budget cuts, it doesn’t. 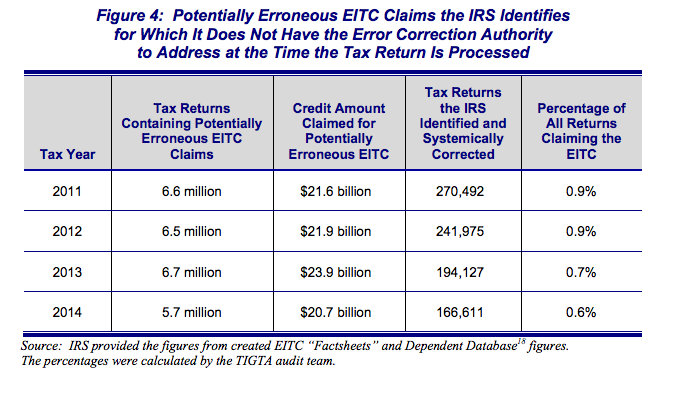 “The IRS can audit potentially erroneous EITC claims; however, the number of claims the IRS can audit is limited by resources,” TIGTA found. 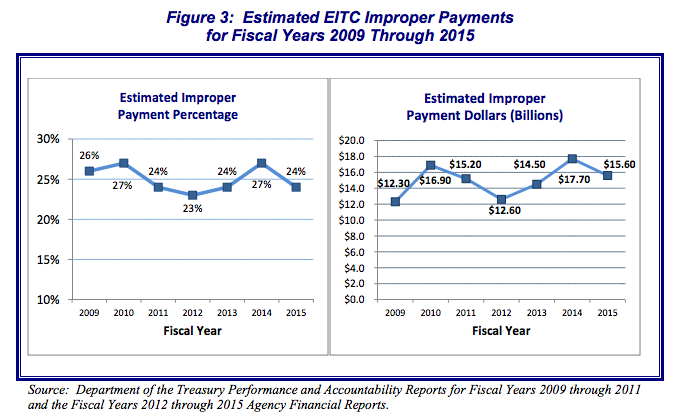 “As a result, billions of dollars in potentially erroneous EITC claims go unaddressed each year,” the agency found. The irony here is that federal agencies that are allowed to invest in the personnel and infrastructure necessary to prevent and/or recoup improper payments typically earn enormous returns on the money spent. One program focused on recouping improper payments recovered 83 percent of the money improperly paid out. However, antagonism toward the IRS in Congress seems certain to prevent the agency from getting the resources it needs -- at least in the near term -- to deliver that benefit to taxpayers.